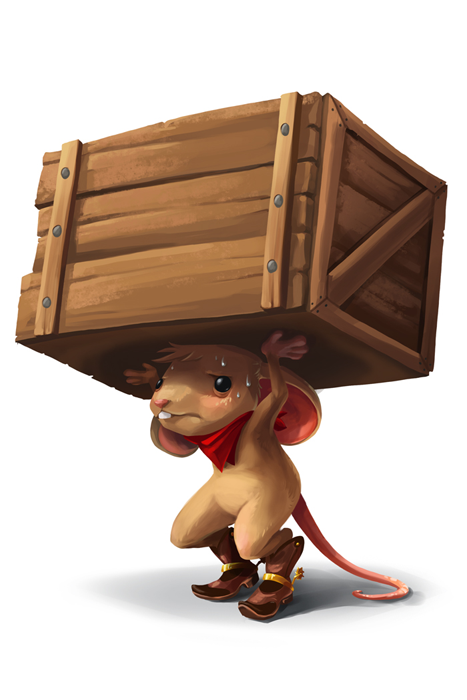 The Cute Crate Carrier Mouse is a breed of mouse found in the Gnawnian Express Station. It can only be attracted and caught during the Supply Depot phase. It is known to drop Iron Pellets and Royal Supply Crates as loot. Don't let his adorable exterior fool you, inside he is one lean, mean, stealing machine! Striving for acceptance with the other train robber mice, this little guy may be small but he gives it his all to show he's got what it takes to be part of the gang! One determined crate at a time! Catching this mouse will earn you 1 Royal Supply Crate. The Cute Crate Carrier mouse has no specific preference for any kind of cheese. Law type traps such as S.L.A.C. are very effective against the Cute Crate Carrier Mouse. The Cute Crate Carrier Mouse drops the Crate Egg and Gnawnian Express Egg during the annual Spring Egg Hunt. 26 September 2013: The Cute Crate Carrier Mouse was released as part of the Gnawnian Express Station location. This page was last edited on 17 May 2017, at 17:29.